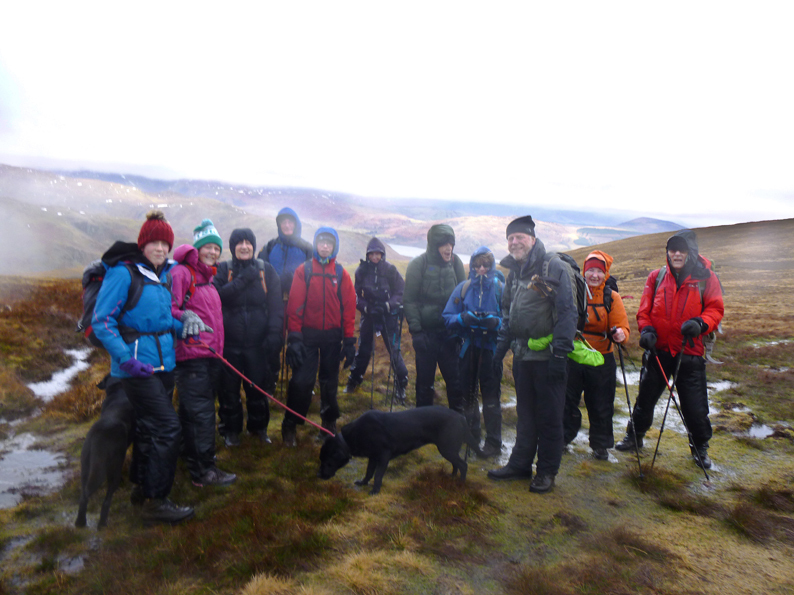 LDWA members Dave, Pat, Andy, Clare, Steve and Margaret welcomed guests Jane, Paul, Anne, Kate and youngsters Martha and Jamie plus two dogs and left Askham on a reasonably calm morning with expectation of some wind on higher land. On reaching the fell we headed south to join and follow the access road to Scales Farm. Well positioned waymarkers took us through the farmyard, down a track, through a couple of fields, over the river and back onto the fell. Easy so far the hard work was about to begin. We now followed our longest gradual ascent of the day up The Pen towards Loadpot Hill. Any thoughts of a leisurely stroll were soon dispelled with the ever increasing wind speeds and gusts. We managed to hunker down for a coffee break and shortly afterwards we spotted the Loadpot Trig. Two LDWA veterans headed off to the trig but the main group skirted around the summit to join the Roman road on the ridge. Once the group was reunited we battled against the gale force winds across the ridge to a junction for our descent into Fusedale. Thanks to Clare for her assistance in finding this path on the recce. With the prospect of easier walking in the valley we made our way carefully down the steep descent alongside Groove Gill. Thankfully there were no casualties but the gusting winds continued to impede our progress alongside Fusedale Beck. Our target was Howtown for lunch. Unfortunately not the hotel. After a quiet wind free lunch it was a straightforward walk back along the Ullswater Way to the Cockpit. On route our more observant walkers may have seen the Wainwright Sitting Stone situated below Arthur’s Pike. On leaving the Cockpit we headed for the fell gate where we retraced our morning steps back to the car arriving about 3 45pm. It was well done to everybody who completed the 15 Miles in far from easy conditions. Undeterred by the weather Paul and Kate have now joined the LDWA and we look forward to their company on our future monthly sojourns.